MicroRNAs (miRNAs) have attracted ever-increasing interest in recent years. 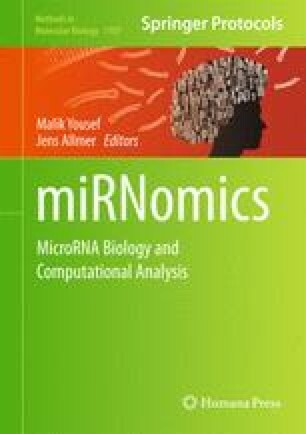 Since experimental approaches for determining miRNAs are nontrivial in their application, computational methods for the prediction of miRNAs have gained popularity. Such methods can be grouped into two broad categories (1) performing ab initio predictions of miRNAs from primary sequence alone and (2) additionally employing phylogenetic conservation. Most methods acknowledge the importance of hairpin or stem–loop structures and employ various methods for the prediction of RNA secondary structure. Machine learning has been employed in both categories with classification being the predominant method. In most cases, positive and negative examples are necessary for performing classification. Since it is currently elusive to experimentally determine all possible miRNAs for an organism, true negative examples are hard to come by, and therefore the accuracy assessment of algorithms is hampered. In this chapter, first RNA secondary structure prediction is introduced since it provides a basis for miRNA prediction. This is followed by an assessment of homology and then ab initio miRNA prediction methods. I would like to thank Müşerref Duygu Saçar for preparing Fig. 1. This study was in part supported by an award received from the Turkish Academy of Sciences for outstanding young scientists (TUBA GEBIP, http://www.tuba.gov.tr).